I’m home again after spending the last 5 days in the Eastern Sierra Mountains. I enjoy doing the workshops but at the end of the 5 days I’m definitely ready to come home and sleep in a familiar bed. 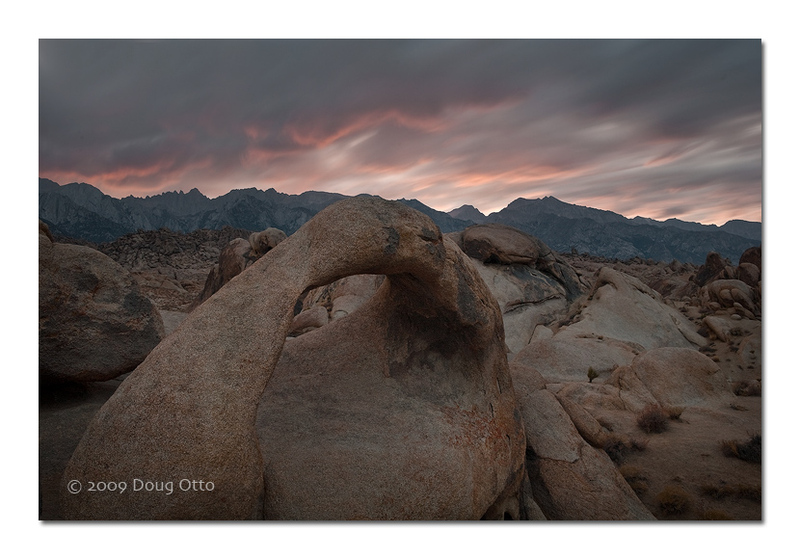 I took this image on the first night of the workshop in the Alabama Hills, at the base of Mount Whitney. Mount Whitney isn’t normally a great sunset location but sometimes you get lucky. Tuesday night was one such night. We drove to the parking area for the Mobius Arch trail and headed out toward the arch. The actual sunset was very uneventful but the real magic started about 15 minutes after the sun was down. A faint red glow began to develop to the North of Whitney and slowly worked it’s way down the Sierra crest until most of the horizon was awash in color. Because it was quite a while after sunset it was quite dark, requiring a 30 second exposure to capture the color. The long exposure also added to the looming feel of the image by blurring the motion of the clouds. It felt very much like we’d been picked up and dropped into the middle of a Lord of the Rings movie. This entry was posted in Photography and tagged Alabama Hills, Canon 5D, doug otto, Eastern Sierra, granite, Mobius Arch, Mount Whitney, sunset. Bookmark the permalink.